Jenny Loo is the owner and operator of The Gentle Clipper's Tub n’ Suds— but there is more to her than meets the eye! Jenny received the "Gentle Clipper" nickname from the veterinary staff at Cascade Animal Clinic. They observed her consistently calm and kind demeanor and gentle handling of animals in her care. She's been a professional dog groomer for over 25 years and is a certified dog trainer through the Animal Behavioral College. Five dogs that Jenny Loo has taught have earned competition titles! She also coaches people in different methods to help them train their dogs at home. Complementing these qualifications, Jenny‘s knowledge base includes boarding, kennel management, animal anatomy, proper restraint and dog handling methods, common household pet diseases, pet nutrition, and solving common behavioral issues. The Gentle Clipper has an impressive and reliable work ethic that reveals her passion for what she does. She certainly “puts everything into it,” as she says and desires to “treat everyone like family.” Jenny Loo’s reputation is impeccable! The Gentle Clipper is an excellent dog groomer! Her attention during the grooming process is focused, purposeful, intuitive and most times FUN! She believes that it is during these grooming sessions that she notices various conditions, behaviors, even serious medical issues that after addressed, will benefit the animals long after they have left her shop. She doesn’t waste time, but rather takes all the time each dog needs. Jenny has perfected that habit over many years with many dogs. There is a consistent commitment to the health and well-being of all those in her capable charge. Jenny Loo loves her profession, and her home life reflects that too. Fish, turtles, ferrets, parrots (including a blue & gold macaw), cats, and dogs have all made her house their home over the years. She is an avid self-proclaimed “pet person” and her clients confide in Jenny when it comes to their pet concerns. She is a good listener and genuinely cares about animals since she knows that they are family. She makes a great effort to help those that are in need, and for many, she has been a real lifesaver. You can read some of their testimonials. Jenny calls the dogs she grooms “kids,” and she is known to them as “Aunty Jenny.” She even has special nicknames for her regulars! 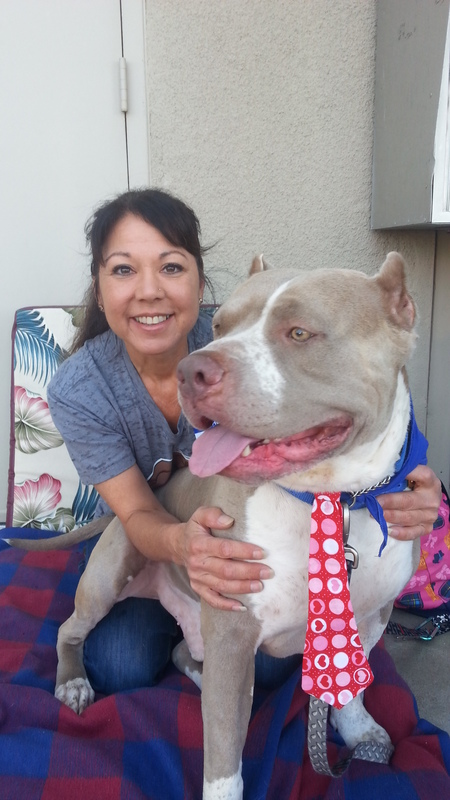 Magnus, an 80-pound pit bull from San Diego, adopted Jenny and they live happily and playfully together in Monroe. Grooming, training, rescuing, and boarding make for an interesting and enjoyable life for The Gentle Clipper. Jenny is a true professional and attentive to all the needs of your pets. Come to Monroe and meet The Gentle Clipper to be greeted by her bright smile and peaceful disposition and have your dogs both cleaned and well-cared for. A recent Facebook post said Jenny is a “patient and sweet caregiver for the past 12 years.” She will be happy to be yours too! All dogs are dropped off between 9-9:30 a.m. and finished between 3-5 p.m. Copyright © 2016, Dog Groomer & Self Serve Dog Bathing Monroe WA, All Rights Reserved.